There are a ridiculous amount of trendy diets, lifestyle changes and detox plans plastered in our face lately. Not like it is really anything new; the media is forever portraying the best foods to eat, the best meals to lose weight and the magical approach to becoming a be a better you plan. The real truth is, nothing is magical and no one plan works for everyone. And, while I am bursting the diet bubble here, a plan that works for you one day, may not work the next. We aren’t machines. Our bodies change and adjust which requires us to stay on top of our choices, swapping out and incorporating foods when necessary. My switch to a vegetarian diet really happened unintentionally over two years ago following a stomach virus. I ended up sticking with this lifestyle after noticing so many immediate and positive effects including but not limited to an increase in my energy level, running ability and muscle recovery, disappearance of seasonal allergies and shingles nerve pain and, most importantly, a positive affect on my menstrual cycle. I don’t think that a diet without animal protein is for everyone but I do think that my body thrives best from a higher complex carbohydrate lower protein diet. But it isn’t fool-proof. Nothing is 100% and after last week’s experience with killer cramps, I decided to take a better look at my diet and see if there were any changes I could make to help minimize the PMS/cramp situation for next month. Certain foods, especially complex carbs and plant-based proteins, are known to alleviate PMS symptoms for women (more on this in a later post). Even though I basically eat this way most of the time, I took a look at my daily choices and made some minor changes. I put a halt to the three-ingredient pancake trend and went back to oatmeal before my run. More complex carbs and less protein. 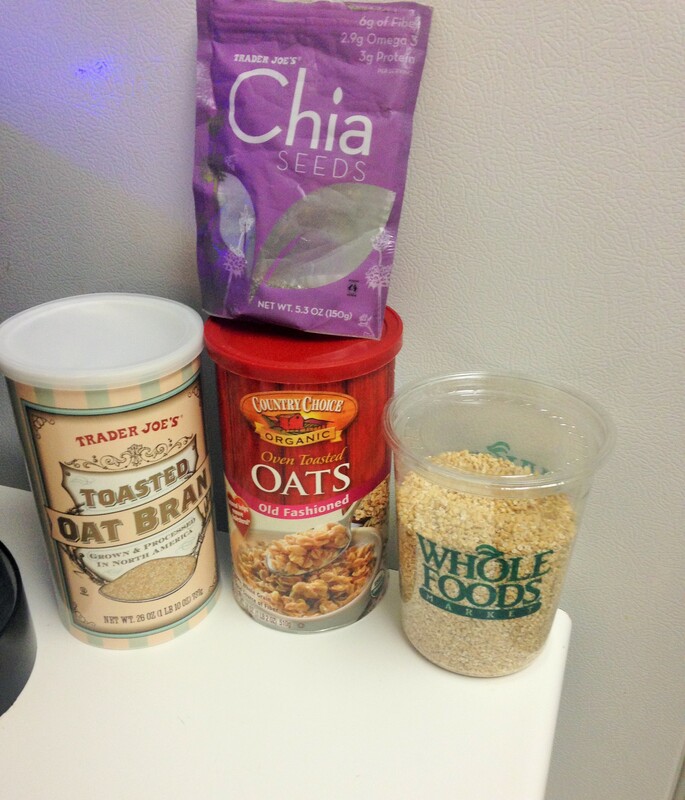 I always make a few servings at a time so this week’s pot included steel-cut oats, rolled oats and oat bran. I like to mix a variety of oat textures to keep things interesting. I bumped up the chia seed servings that I mix in the pot and eliminated the extra egg whites. Chia seeds contain protein, fiber and omega-3’s so it’s all good. 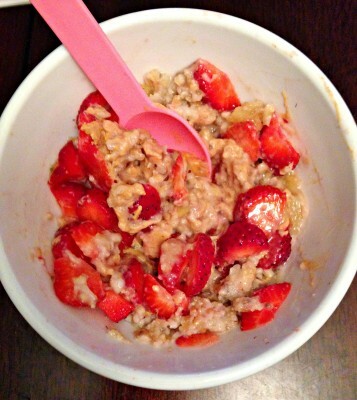 Oatmeal mixed with bananas, chia seeds, strawberries and PB2. Remember, I use PB2 before my runs because it sits lighter in the stomach. I can’t begin to tell you how much better I have been feeling when I run in the morning. I didn’t even realize the egg whites were bothering me at all until now when I have been running without eating them. I just feel full but light in the stomach and ready to move. It makes sense though; protein takes longer to digest therefore it is always recommended to go higher on carbs and lighter on protein before a run. My stomach has always been pretty tough and I wake up so hungry that the extra protein was necessary but for now, this is really working for me. After my runs, I usually have a repeat bowl of the above but do add a scoop of plain greek yogurt still (protein for muscle recovery) with peanut butter. Lunch, oh lunch, how I love you! Yes, this is me talking here; the original lunch-hater is now looking forward to the midday meal all morning. 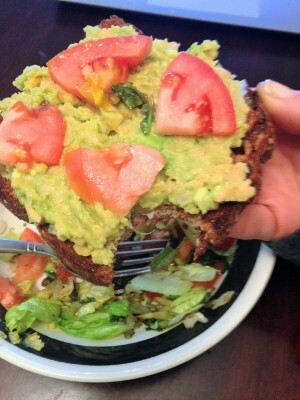 Cinnamon Raisin Ezekiel toast with mashed chick peas and avocado decorated with plum tomatoes. It is so simple yet so amazing that I insist you try it. All you do is mash a serving of chick peas (half cup will give you enough for two slices of bread) with some avocado. I know you love my ice cream shaped bowl that I use to mash the chick peas and avocado. There really isn’t more to this recipe since I don’t add any seasonings. 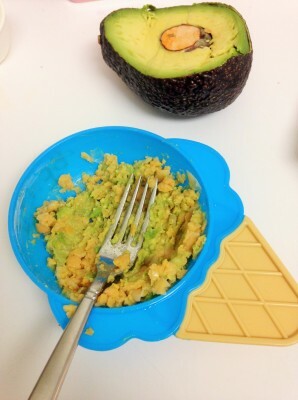 I find that food alone really has flavor, especially a ripe avocado. I am sure you can add pepper or whatever else you fancy but trust me, doesn’t need a thing. Along with my savory lunch, I require a sweet side in the form of another slice of cinnamon raisin toast with peanut butter and chopped fruit just to cap off the meal. My body enjoys a sweet conclusion and I have no interest in ever changing that. 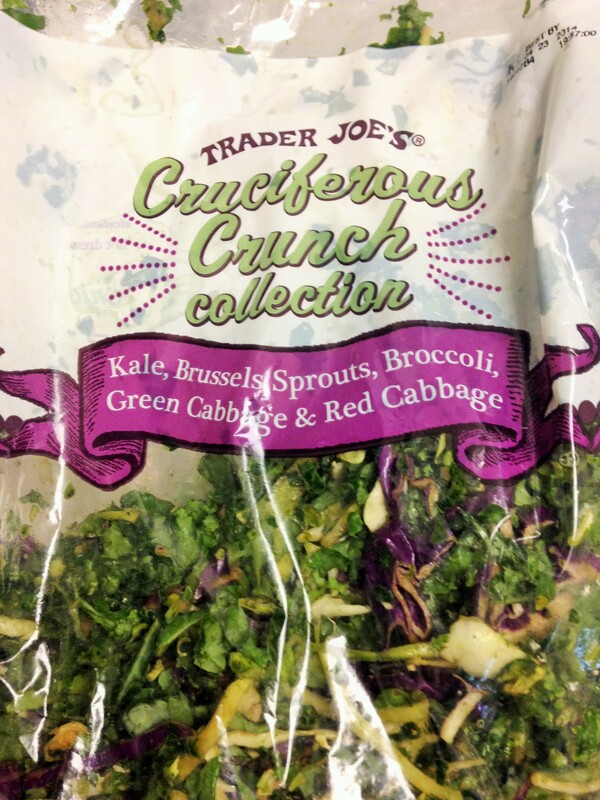 I bought this new Cruciferous Crunch Mix from Trader Joe’s the other day and can’t explain why I love it so much but I do. I have roasted this mix, sautéed it and added it to salads. I don’t know if it is the kale part or the broccoli part or the Brussels sprout part but something gets all flavorful in there, especially when roasted. I have been off sweet potatoes this week and totally on brown rice, specifically the Brown Rice Medley from Trader Joe’s. 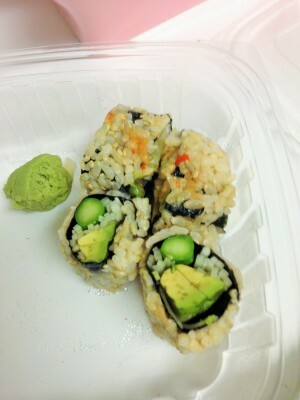 This craving has been working well for me especially since I had leftover sushi to eat the other night. I don’t normally have leftovers, let alone leftover sushi, but I was so full when we went for Japanese that I brought a bunch of rolls home. I ate a few while dinner was cooking and added the rest to my stir-fry plate. 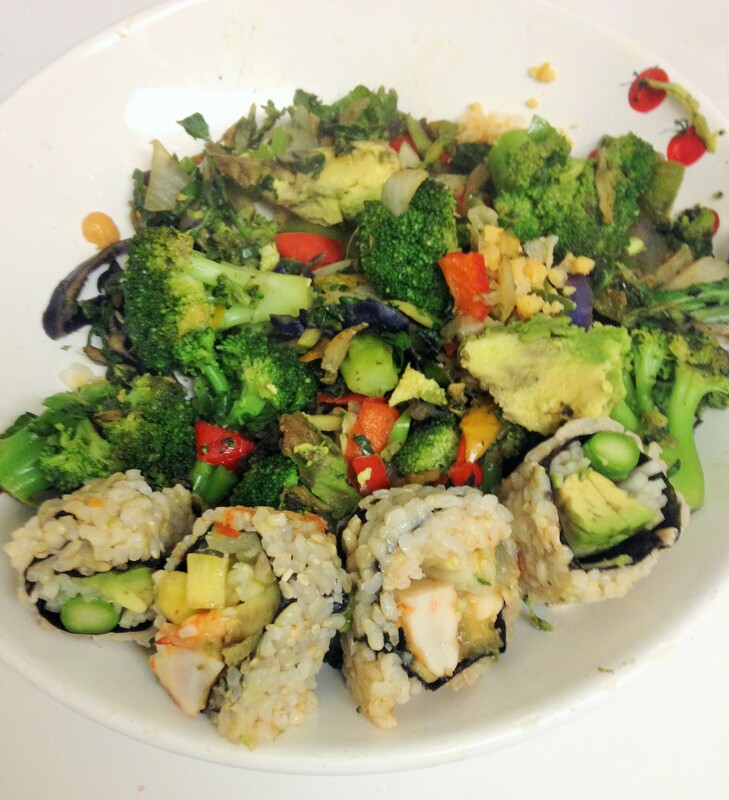 Roasted vegetables, brown rice, chick peas and avocado in a sweet chili sauce with a side of sushi. Well look what we have here, something different…but the same… but different. My evening hit of peanut butter and chocolate has been involving popcorn instead of an apple. I haven’t fully figured out the logistics of how this snack works and sometimes use a spoon but no matter how it lands in your mouth, it is a terrific combination. I am noticing that my stomach is happier in the evening without the apple. I didn’t think that popcorn would be any easier on the stomach than an apple but it seems that way. Overall, my body seems really happy this week. Perhaps it is the focus more on carbs than protein, perhaps it is simply the minor tweaks to the diet which is good to do every now and again or maybe it has nothing to do with either and everything to do with my hormone level this week. That’s the thing – we don’t ever really know for sure. And, even when we do know for sure, our bodies can change on us and require something different tomorrow. Make sure to check out what everyone else is eating today! Did you enter yesterday’s Momentum Giveaway? Winner to be announced Friday! Have you made any minor changes to your diet recently? Do you find you do better with more/less carbs and/or more/less protein? How About A Giveaway Today? I switched to a vegan diet a little over a year ago, and my body loves it! Eating a high carb diet makes my runs feel fantastic, and I never have stomach issues. Also, I do most of my shopping at TJs, and I have NEVER seen that awesome veggie mix! I need it in my life! 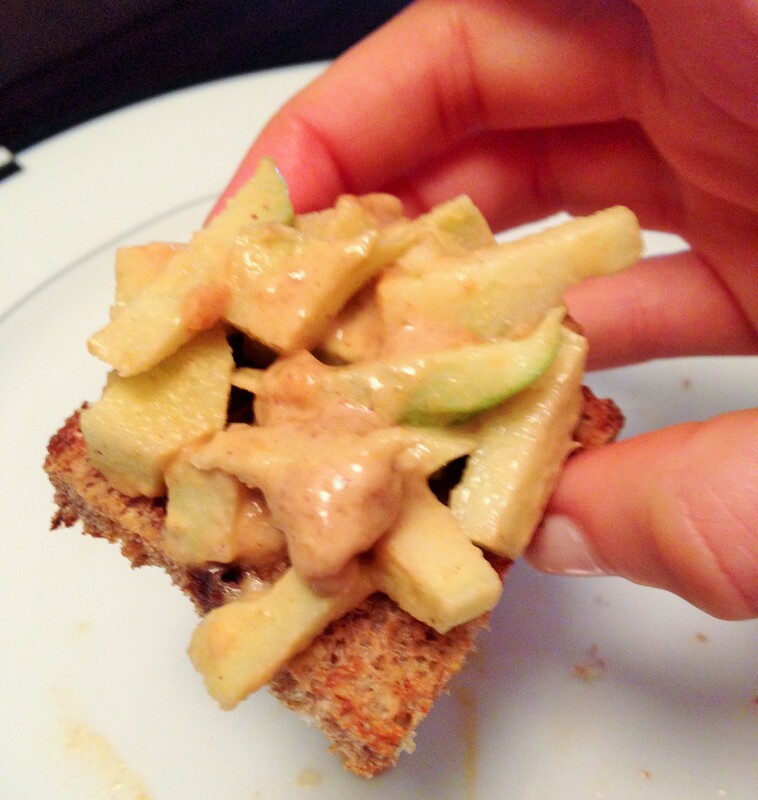 Finally, my friend told me that avocado on cinnamon raisin bread was weird, but it’s definitely my current fave snack. Glad someone else is on board with it! I am pretty sure the crunch mix is new – I just spotted it the other day…And cinnamon raisin bread is amazing with anything; sweet or savory, it is always terrific. Tell your friend to try it and then let us know her opinion! It is just ridiculous with avocado, but isn’t everything? Totally agree; what works for me today isn’t guaranteed to work for me tomorrow. Some days I am full, some days I am starving and some days I feel the need for more carbs and less protein or the reverse. Lunch has been lots and lots of eggs cause I’m trying to get through that section in the cookbook. Basically breakfast has been the same smoothie for a few weeks now and lunch is cookbook recipes. Two breakfasts a day?! I’ll take it! I could eat breakfast foods all day long! That’s the thing with working with trainers, nutritionists or even following what magazines say – it really depends upon you and what works best for you. Amanda @ .running with spoons. recently posted…. WIAW … one breakfast is never enough . Amazing how we all agree yet the media portrays the carbs as bad. So happy to hear that your body is feeling good this week! I have noticed some similar things to you when it comes to digestion and how my body feels best… oats are a great breakfast for me, and I find that they leave me the perfect amount of fullness before a workout. And it makes sense that your body is adjusting well to not having an apple at the end of the day– fruit can be hard on the tummy after dinner, which is funny because people always associate fruit as being a light dessert! 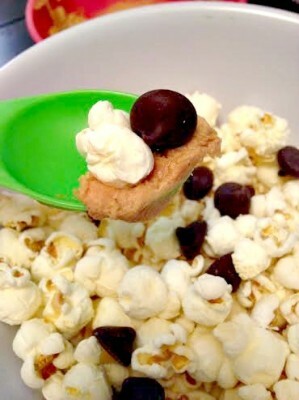 Your popcorn, chocolate chip, PB concoction looks WAY too good. And thanks for bursting the “diet bubble”– so important to remember how different everyone’s bodies are. It’s funny – I know not to eat melon on a full stomach but never bothered to include apples in that list. It is so true – fruit can hard to digest and people don’t realize it! In fact, I almost always have an issue with apples at any time of the day I just try to ignore it. Usually if I eat them plain is when I have the most trouble. Oh how I miss sushi already. I’m all about the carbs but then sometimes I get huge cravings for meat or peanutbutter. I guess it’s my body telling me what I need. I try to just listen to it instead of telling it what to do! You only have to avoid the raw fish though, right? If so, get the veggie rolls or the cooked shrimp rolls – so yum! I’m all about bio-individuality. Figuring out what way of eating and which foods work best for your body can be a daunting task but one that’s so worth it. I hope you’re right about the egg causing some discomfort for you simply because protein takes longer to digest, but have you ever considered food allergy testing? I had it done, and my results came back that I had a slight intolerance to eggs. I wasn’t happy to get this news, since I love eggs, but after eliminating them for a few months, I was able to eat them again without issues. I don’t think it’s an egg allergy issue; more of a less protein/more carbs are better when running 30 minutes later issue but I guess one never knows. I never really noticed a problem while I was running after the pancake; I just noticed how much “better” I felt this week. I do have some other minor food allergies though! I have been mixing it up for lunch today was a mexican theme, with brown rice, ground turkey and some veggies but yesterday I had an egg white scramble with toast, cheddar cheese and apple slices! I agree that sometimes we need to mix things up and try new foods! The chickpea and avocado combo is AHmazing! I have not tried it on toast yet, though, so I will have to do that! You must try it on the Ezekiel Cinnamon Raisin. It is terrific and my favorite meal of the day lately. I love this post!! I find the only thing that agrees with me before long runs are oats and yours look delicious !! I have also read not to eat apples before a workout bc it makes the stomach gassy which def has happened to me !! Love that you are changing up the diet aaaand that lunch looks amazing, I need new lunches in my life ! 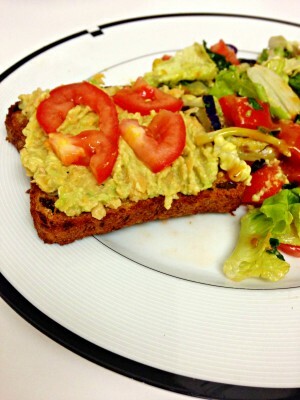 You must try the chick pea/avocado mash for lunch. Especially on cinnamon raisin toast. Like for real, I am loving lunch these days. Is it strange, what I like to run after snack protein more? My best run was after my lentil soup! Eggs and yogurt also work perfectly. Seriously, despite my love to bananas, it is difficult to me to train only on carbs.